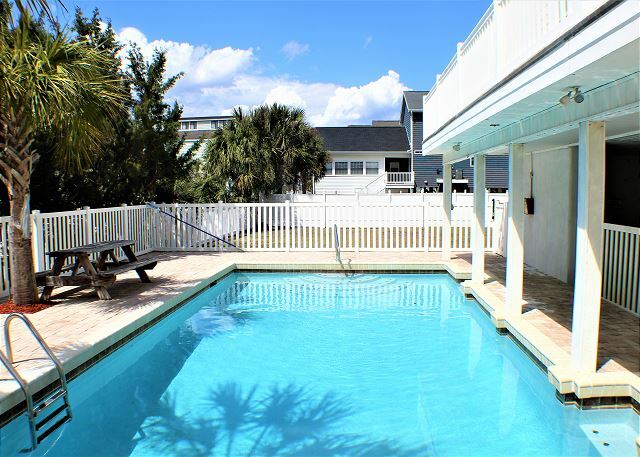 This raised duplex is located in the Cherry Grove section of North Myrtle Beach. 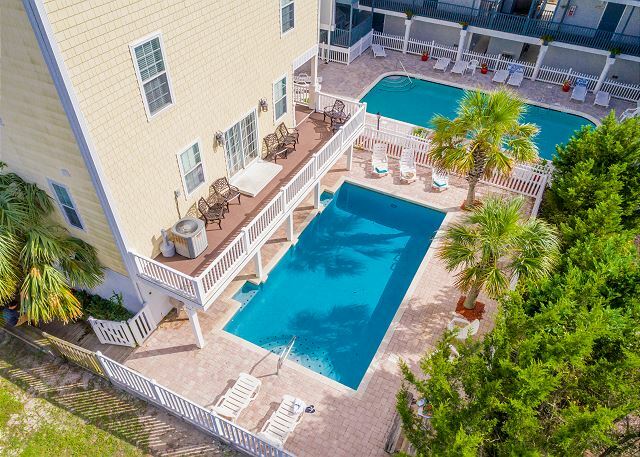 The "Sunrise" side provides peeks of an ocean view and wonderful sunrises over the ocean! 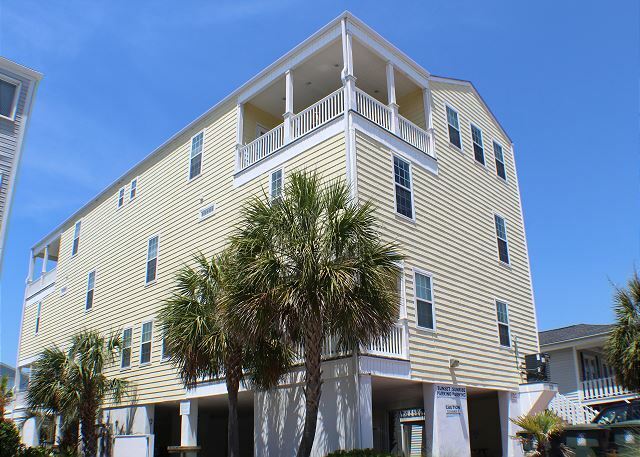 This unit is three stories with connecting doors on the first and third floors when rented as one property. There is a shared pool and hot tub. 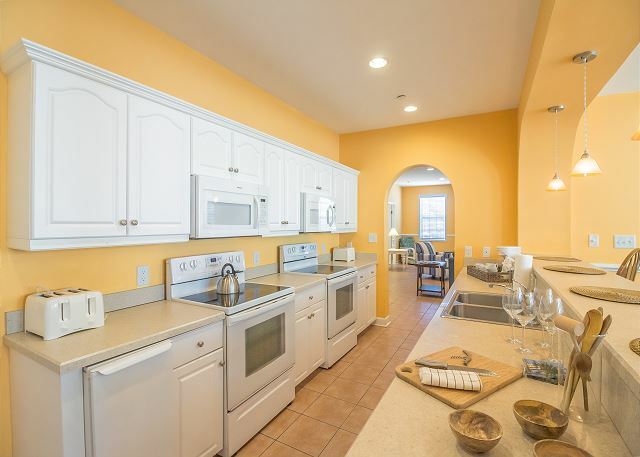 The kitchen includes 2 refrigerators, 2 stoves and 2 dishwashers and full laundry room. 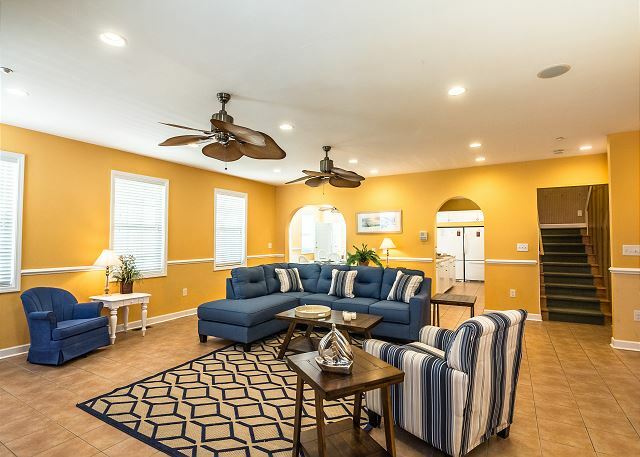 The first floor includes: a large spacious living room with sectional seating, kitchen (with double the appliances), dining room with 2 tables with seating for 12 (plus additional bar stools), full bathroom, separate laundry room with washer/dryer. 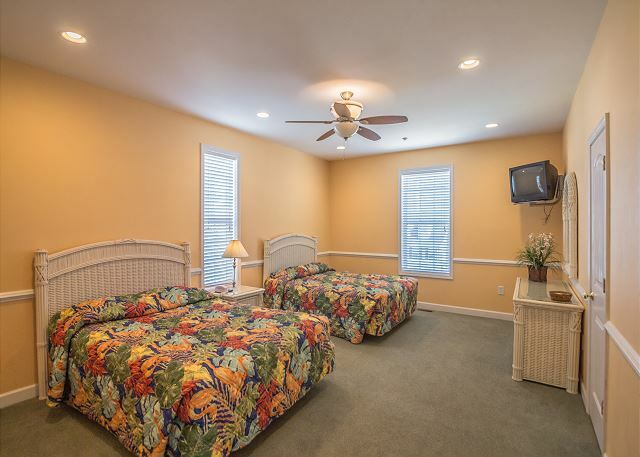 The second floor has 4 bedrooms and 4 full bathrooms -- two rooms have 2 queen beds in each, one room has 2 queen beds + twin/full bunk and the other room has 2 twin beds . 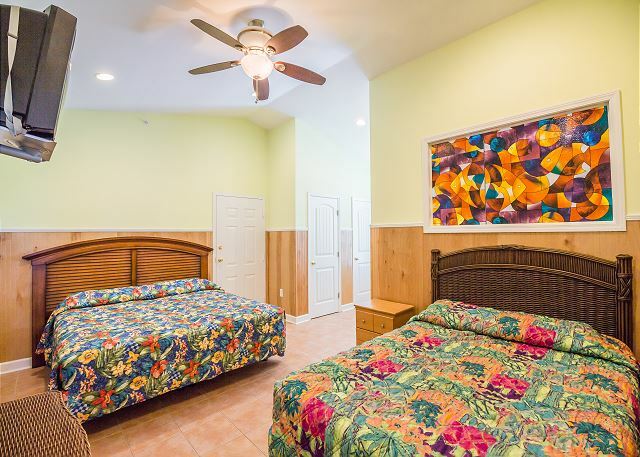 All of the bedrooms have new flat screen 54" Samsung smart tvs with all of the latest entertainment apps. 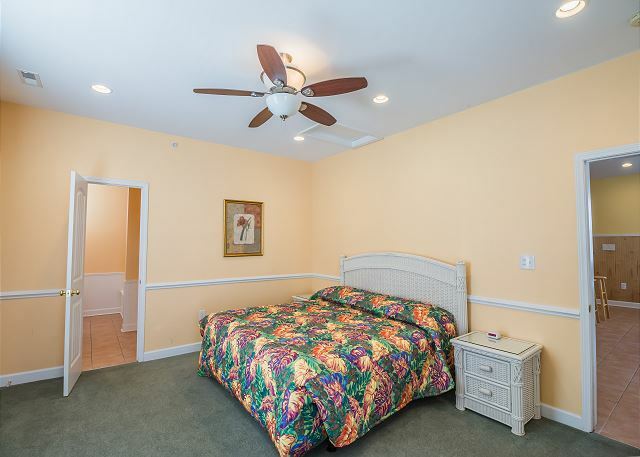 The third floor is where you'll find 2 bedrooms and 2 full bathrooms and the game room. 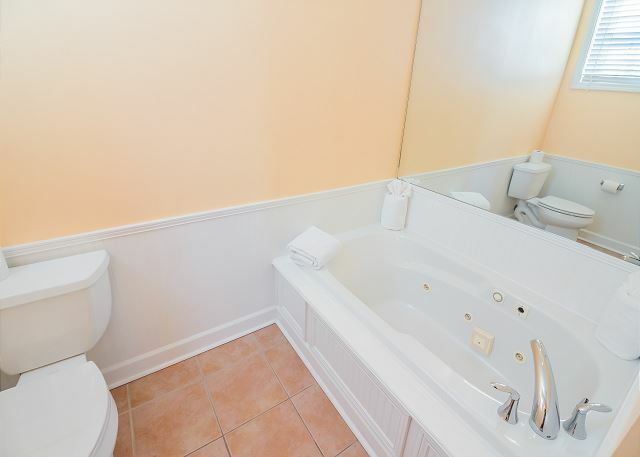 The master bedroom has a jetted tub and shower stall. The game room has a widescreen TV and arcade game, plus plenty of family friendly board and box games. 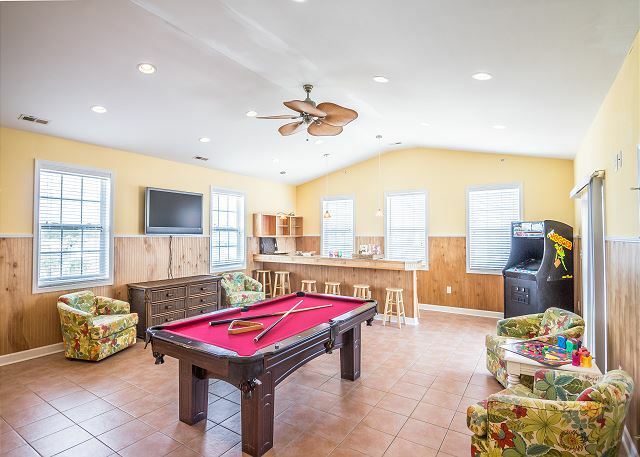 The game room also has 2 bars - one large and one small wet bar on each side of the room - with mini-fridge, microwave and sink. PARKING: Under the building there is parking for about 7 vehicles when renting half of the house. It's OK to rent golf carts -- making it easier to get around town! BEACH INFO: About 1.5 block walk to the public access and the beach. There is a storage closet for coolers and beach supplies. Thank you for choosing to stay with us for your group's beach getaway plans. We, at ODVR, appreciate any and all comments regarding our properties. If it is important enough for our guest to mention then, it is important enough for us to pay attention. 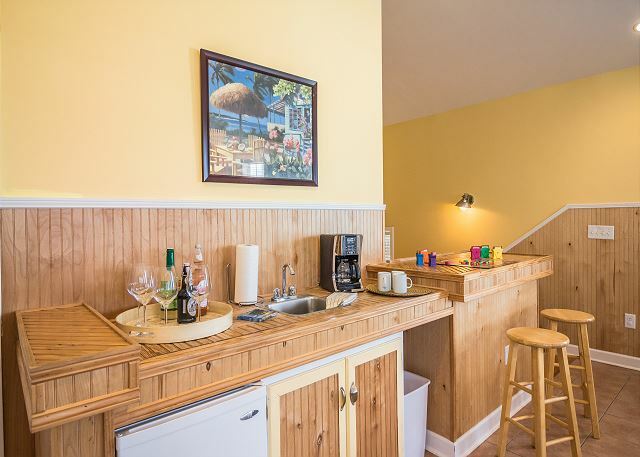 Tropical Impulse is a great and large family beach house for groups of 20 - 40 people to enjoy. 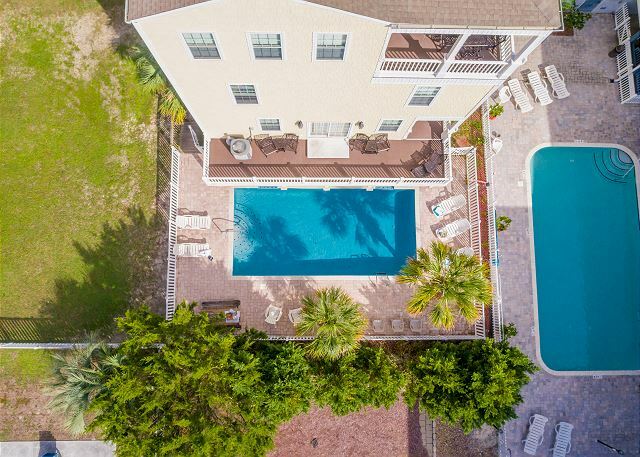 Large gathering spaces, lots of bedding, double kitchens & appliances, game rooms, private pool, hot tubs and all just across from the beach for easy walkability. You can also rent a golf cart for extra fun factor. We hope your beach memories will last a lifetime but call us again if you plan to return. Thanks again! The ladies I dealt with booking my vacation were SUPERB! We were a group of 10 arriving from various locations. This accommodation gave us room for solitude and peace as well as togetherness. There were a few minor issues when we arrived, but they were dealt with immediately. The only real complaint was the internet connection. It was erratic and unreliable. The stay was very nice the unit is large and spacious in a quiet area of town. Everything was as advertised and I would recommend for large groups and/or families. Thank you for the kind kudos about this great private beach home, Tropical Impulse. 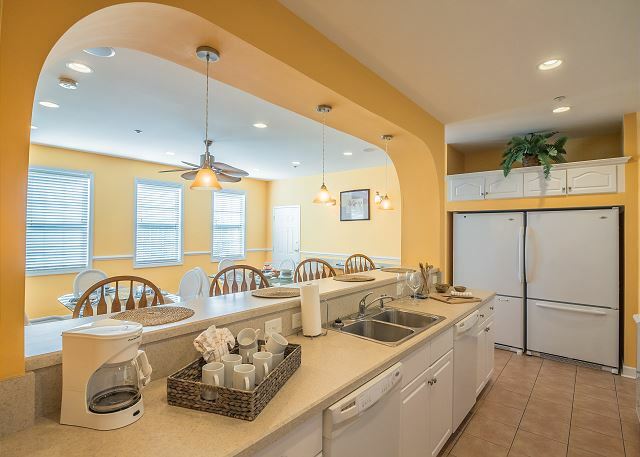 We agree that it is a wonderful, family friendly space for gathering and making memories here at the beach. 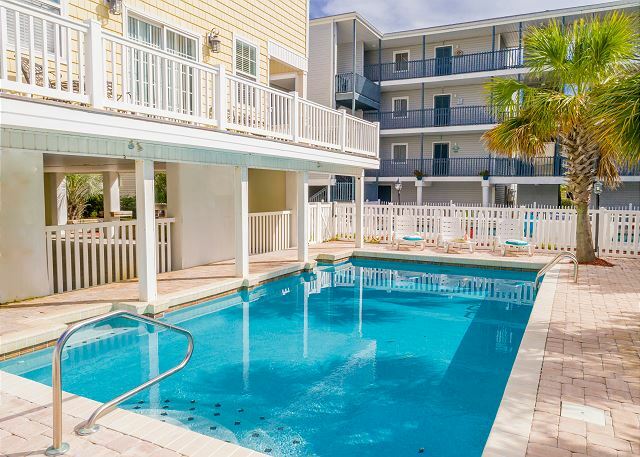 It's the perfect house for enjoying home-cooked meals, game nights and sunny pool days together, yet everyone still has a place to retreat when they need a little downtime. We welcome you back in the near future and hope you will recommend us to friends. Thanks again. The house was very roomy, and it was nice having our own hot tub (not having to share with the other side of the duplex)! Very convenient to the beach--great location. Perfect for walks to where the ocean and inlet meet. Lots of towels for use in the house. Outside faucet problem was fixed promptly. Overall, a good rental. Jennifer, thank you so much for taking the time to complete our survey. Tropical Impulse - Sunrise is a new rental property to us and your feedback will aid the owner in making improvements to his property. We really hope that you will come and see us again next time. Sincerely your ODVR team. everyone was very helpful as we were in a bind and needed to book something very quickly. the unit over all was nice and a good size. the items in the house were a bit more wore than i would prefer and the games provided were mostly non-functional.